The olive trees on the west side of campus are among the oldest trees in Tucson. They were planted just after the University was established in the late 1800s by Robert Forbes, the first head of the Agriculture Experiment Station. The mission of the University’s Ag Experiment Station is to evaluate crops for potential success in each area of the country. As Forbes was particularly interested in trying fruits and nuts from the Mediterranean lands, the largest olives and date palms on campus are his legacy. Forbes also planted olives in neighborhoods throughout Tucson, and a short street where his house stood is named Olive Road. (This house was on the site of the current Center For Creative Photography). Forbes lived to be over 100 years old and was a steady presence on the University campus throughout his life. Until his passing in 1967, he maintained a dedication to and interest in the University, its students, and its research projects. He left all his papers to the Arizona Historical Society. Notes from an Assembly Talk, dated March 1, 1934, cite Robert Forbes as saying “On April 1, 1895, they planted a row of olive trees from Santa Barbara on the west side. Those in front of the girls dormitories (along North Campus Drive) I planted later.” It is highly likely the trees mentioned by Dr. Forbes came from Stevens and were some or all of the above varieties. They are Italian, Spanish and French in origin." 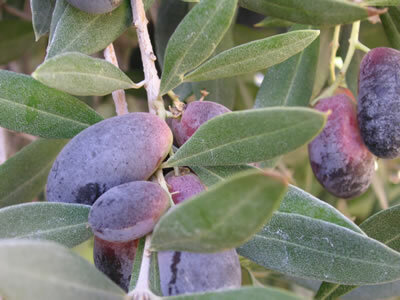 The University of Arizona Historic Preservation Plan, adopted by the Board of Regents in 2006, contains detailed information, compiled and written by Thomas Brown and Elizabeth Davison, regarding the source of the UA olives. An excerpt from the document reads: "It is known from old nursery catalogues that at least 46 varieties of olive were being offered in California nurseries between 1885 and 1895. The Santa Barbara nurseryman Kinton Stevens, in his 1891 and 1893 catalogues, offered the following varieties of olives: Cucco, Fantoiano (Frantoio, Frantojo), Manzanillo, Mission, Morchiaio, Morinello (Morailo), Nevadillo Blanco, Nostralis, Palazuolo, Picholine, Redding Picholine and Rubra (Caillon)." This data suggested that the Kinton Stevens Nursery was the source Dr. Forbes used, but there was no definitive written record to confirm the origin. The Kinton Stevens Nursery offerings in 1890 were advertised as rooted cuttings from trees on his property. This meant that if our olives were derived from clones of this Santa Barbara Nursery, they would be genetically identical. In the 1940s, the former Kinton Stevens nursery site in Santa Barbara was bought by a Madame Ganna Walska, who enhanced and expanded the gardens with the help of Stevens’ son, Ralph. When Madame Ganna passed away in 1984, at the age of 97, the estate, including some century-old olive trees, was made into a public garden, now called Ganna Walska Lotusland. To confirm the origin of the Forbes olives, The Campus Arboretum contacted the staff at Lotusland in 2006, and arranged to have their olives tested for any genetic linkage with the UA olives. To confirm the varieties and the assess the genetic relationships, graduate student Jolie Golden collected cuttings of 35 of Robert Forbes' olive trees and additional cuttings of the Lotusland olive trees. Cuttings were rooted and grown until leaf tissue could be collected for DNA analysis at the UC Davis Olive Center. Support for Jolie’s work came from a generous donor. Results from the DNA analysis confirm that some of the same olive varieties sold by Kinton Stevens in 1890 are here on campus. The 35 UA olives running north and south on Olive Walk, just inside the Main Gate, include the following varieties, all verified by the UC Davis database: Mission, Chemlali, Mavrelia, and Manzanillo. However, the samples from Lotusland olive cuttings did not match any of the 35 tested UA olives. This means that, while we can't conclude that Dr. Forbes never planted Kinton Stevens stock, we can confirm that the olive trees surviving on our campus were not derived from the Lotusland stock. By comparing the varieties in the Kinton Stevens catalog to those listed in the the UC Davis database of California olive varieties we can see not all olive varieties originally sold by Kinton Stevens were not well suited to the California conditions (and are not in UC Davis’s listing). Forbes interest in variety trials aimed to customize cultivar selection to match the specific environment in which the trees would be cultivated. More than 100 years later, our study confirms what Robert Forbes set out to determine - that the Mission, Mevrelia (Morailo), and Manzanillo varieties are best suited to Tucson and several other varieties on our campus, which were not available in California at the time, have proven to be uniquely suited to Arizona. More than a century after planting, the olive trees provide more than education and research opportunities thanks to Dr. Forbes foresight as explained by Thomas Brown in the Historic Preservation Plan: "The Olive Walk is an excellent example of the mix of influences that result in the unique qualities of historic landscapes on campus. It is a tree lined allee’, a popular feature in European landscapes and emphasized anew in Victorian times. However, Forbes integrated the research mission of the University with the improvement of landscape by planting several different varieties of olives on a trial basis. Normally an allee’ would have been lined with one variety of tree." Robert Forbes initiated a legacy of combining research and education with artistic expression and beauty that is perpetuated through the efforts of the Campus Arboretum. We invite you visit and experience the results.